That was the day’s refrain. The third of four times my wife Deborah or I repeated it was the third of four times we lifted our new ultralight Wenonah kevlar canoe off or onto the roof of our car, with barely more effort than it takes to lift a mug of coffee to our lips. Don’t get me wrong. We’re thankful for the seventeen-foot Old Town Discovery canoe we’d bought a quarter of a century earlier when the oldest of our sons was young, and the youngest hadn’t yet entered the world. In terms of durability and delight delivered per dollar spent, it was one of the best purchases we’ve made as a family. It has carried us on overnight camping trips, day trips, and short picnics. We’ve paddled it on big lakes and small rivers, hauled it on wheels into remove mountain ponds, and even paddled it on saltwater a time or two. Though over the past few years since our boys have grown up, we’ve mostly paddled it tandem, it still has a third seat popped into the middle from days when it hauled our entire family of five plus a dog. It has withstood several beatings from use, and several more from sitting outside through New England summers and winters with never a roof over its head. And it kept on floating. It took a snowplow straying too far from our driveway two winters ago to even put a crack in it, and even that couldn’t sink it. It also weighs approximately ninety pounds according to one on-line catalog. Though canoeing ranks at the top of the list of our favorite activities together, as our ages have crept upward, the burden of lifting a ninety-pound canoe over our heads, turning it upside down, getting it onto the roof of our car, and then off again, not just once but twice every time we went paddling, has proven an increasingly greater disincentive to go canoeing. So a couple years ago we began longing for a lighter canoe, and I began reading about the options. 2018 was the year. Our thirtieth anniversary, and my recent selection as an artist-in-residence at Acadia National Park, proved the impetus for us to move forward with the dream. 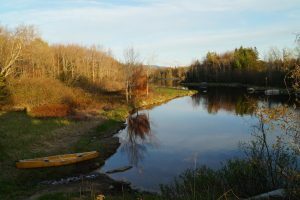 A central part of my residence at Acadia is writing about the abundant lakes and ponds and cold freshwater streams—and the associated ecosystems that have evolved around this geology—that is a unique feature for a relatively small island off the coast of Maine. Meeting some of the native cold-water fishes that inhabit these waters was also part of my proposed plan. I envisioned near-daily paddles around the park’s ponds and lakes including on some waters accessible only via hike and portage. This was a perfect excuse for us to get the new canoe we’d been wanting. So after talking with a sales rep at Wenonah about our paddling styles—we mostly paddle lakes and quiet rivers, and were looking for a good balance of stability with maneuverability—we settled on the Heron, a fifteen-foot model weighing a mere thirty-eight pounds in the ultra-light kevlar version. That’s less than half the weight of its predecessor. So there we were, unloading the honey-colored Wenonah heron from our wasabi-colored Subaru by the side of Northeast Creek on Mount Desert Island, just a few yards above tidewater, with the iconic peaks of Acadia National Park just a few miles away. And as we plucked the new canoe off and set it down on the grass in relative ease, Deborah and I were both wondering why it had taken so long to make the purchase. I also wondered why it had taken me so long to come to Acadia and to Mount Desert Island. As the only national park in all of New England, and one of the most visited in the country, it has been a household name for as long as I’ve lived. Somehow, I’d never made it. Until this week. 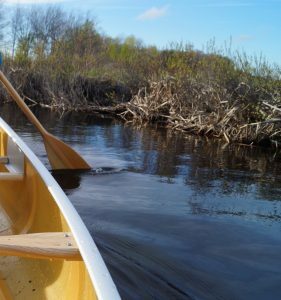 As we paddled up Northeast Creek, facing Acadia National Park though just outside its boundaries, the sounds of the traffic of ME-3 slowly faded behind us, replaced by the calls of thrushes, mourning doves, crows, and the sough of wind through grass. After rounding a few corners, we came through a gap in the trees and a vast wide wetland marsh opened up in front of us, with the park’s peaks appearing in the background beyond. We continued on. Several times we came to a bend in the creek, or saw what appeared to be a beaver dam ahead, and thought our journey had ended, but each time a way opened up. Not until we had made it close to three miles up the creek did the stream final grow too narrow, shallow, and clogged to continue. We turned and paddled back downstream into the wind and the pinkish-yellow globe of sun dropping through thin clouds to the west. Twice a small group of deer appeared by the river, browsing on streamside snacks. They kept a nervous eye on us, but didn’t flee. Back at the car, we hoisted Honey back up on to Wasabi. For the fourth time of the day we repeated our refrain. But now I really did mean two difference things.